Want to skip the history? - Scroll down to the black text. It had been an eventful summer. I felt the need of own time. It would be nice to relax and not have to talk to anyone for a while. Just to indulge myself without haves. Me and my wife agreed that I would be in the country one week on my own. I slept for an hour each afternoon. I needed it for recovery. The first days I did nothing at all except for sleep and eat. Then came the motivation back again. I went around the fields, fixed small things and planned for new projects. The first point had been hanging on my shoulder for more than a year. The fire wood was about to run out. There was a problem. I did not dare to start the chain saw and fell some trees. Even less, I had the strength to gather logs and chopping wood. A friend also had bought a machine sawn and chopping wood. He had a large enough production that he started selling ready-carved wood. I took my old military truck and went to him. On my truck he loaded nearly four tons of dry and fine birch sawn into 30-centimeter lengths. The price of the fire woods was the most affordable. Once back home, it was only one problem. The load should enter the barn for storage, and I almost could not walk. The solution was that I removed the bucket on the excavator and lifted the sacks into in the barn. They weighed nearly a ton each. It was on the border of the excavator strength to lift pallets. Once inside, so I just ripped up the bag when it hung in the air. The barn was full of dry, fine wood, without I had moved a stick by hand. It is to work with the head in place, instead with the body. Today, +29 days after stem cell treatment. My status is still good, even if I got a mild flu. No fever, just a little sick. Not that bad that I skipped work. The consequence is that my body is not responding so well. I have not been "sick" (except for MS) in more then ten years. Interesting. 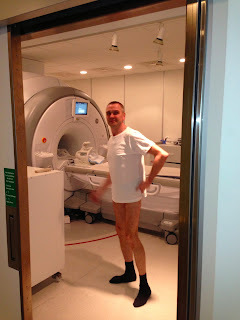 In the afternoon it was time for the four week post transplant MRI. When they took me out of the tunnel, I was informed that the T1 session was corrupt. We can´t shoot again because you have got contrast fluid. You need to come back Friday. (c)Dennis 2013. Awesome Inc. theme. Powered by Blogger.